Thank you for your valuable feedback and your comments. Ste fantastickí! Vďaka, bola som včera v Berlinke a bol to pre mňa obrovský zážitok! 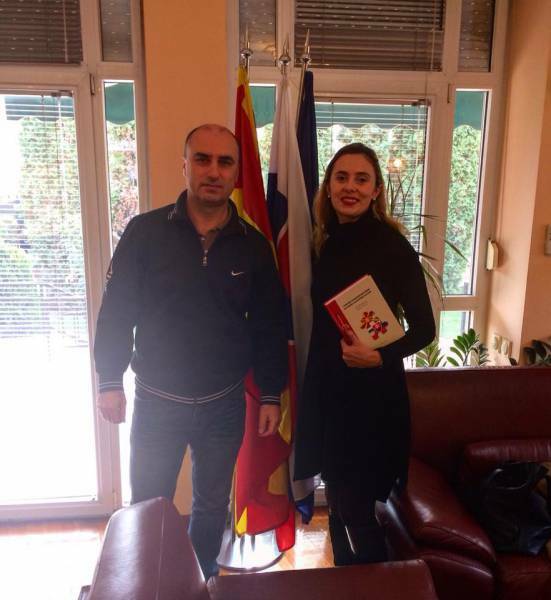 On the occasion of my participation at the ARS POETICA International poetry festival in beautiful Bratislava and of my poetry publication in Slovakian language, I was received by Mr Chlupik, Chargé d’affairs of the Embassy of Slovakia in Macedonia. I was glad to give them the poetry book published by Ars Poetica 2017 and as a gift I received the Slovak-Macedonian dictionary. Slovakian, my next linguistic skill? Sure, looking forward to a new language! and for your precious invitation at the Festival of Poetry ARS POETICA. challenging. I am inspired now and I learned many new things. have my poetry published in Slovak language. Thanks a lot for welcoming me in your festival, I enjoyed it a lot! I would like to say a huge thank you to you. Spendig this Friday with you was honestly a very determining time. for your perfect and open minded work, your empathy and energy in the name of art & poetry! Bola som na krste knihy Mily Haugovej Srna pozerajúca na Polárku, bolo to nádherné, ďakujem Vám! Aké knižky chystáte vydať v najbližšej dobe? Thank you for inviting me to you wonderful festival. I had a really exciting time. Thank you and all the volunteers for hosting us. We thoroughly enjoyed our time there. The materials were superbly produced and the graphic work accompanying the visuals were splendid. The days at Bratislava were beautiful. Everything was perfect and I enjoyed Ars Poetica immensely. I hope that we'll meet very soon, in Portugal, Slovakia or elsewhere. Chci Vám poděkovat za příjemné dny v Bratislavě na Ars poetice. A poděkování a pozdrav Vám mám vyřídit i od Šárky. Díky festivalu jsem poznal několik velmi zajímavých autorů. A společná performance s Dirkem Hülstrunkem v té atmosféře byla asi vůbec nejvydařenější za celou dobu, co spolupracujeme. I wish to express my gratitude for the lovely Ars Poetica Festival. You are doing a GREAT job for POETRY & poets! Hoping to meet you soon in Macedonia. Thank you for the lovely atmosphere during Ars Poetica Fest. We loved Bratislava. It will be in the sweetest parts of our memories forever. Several weeks ago we were sitting in a coffee in Bratislava with Canadian poetess Claudine Bertrand. The waiter was convinced he knows from somewhere Claudine. I told him she is for a while here and he cannot know her from anywhere. He asked me what she is doing. I said she came for a poetry festival Ars poetica and she is a poetess. He immediately said that last night he saw the news on Slovak TV and they spoke also about the festival and Claudine talked for a while! Next time I went to the coffee alone he asked me if Mrs. Bertrand is already gone and he very well remembered me. So, I think Ars poetica is the only poetry festival I know that hosts so many people and the public is numerous... and you can even become famous as a foreigner in Slovakia, because there is a big interest about it from the part of medias. Thank you once again from my name and the name of Claudine Bertrand to having been part of it, dear Martin Solotruk and Martina Straková!